"And They Said it Wouldn't Last"
Got a really fun one today! Think we need it after those last couple of Titans books we discussed! 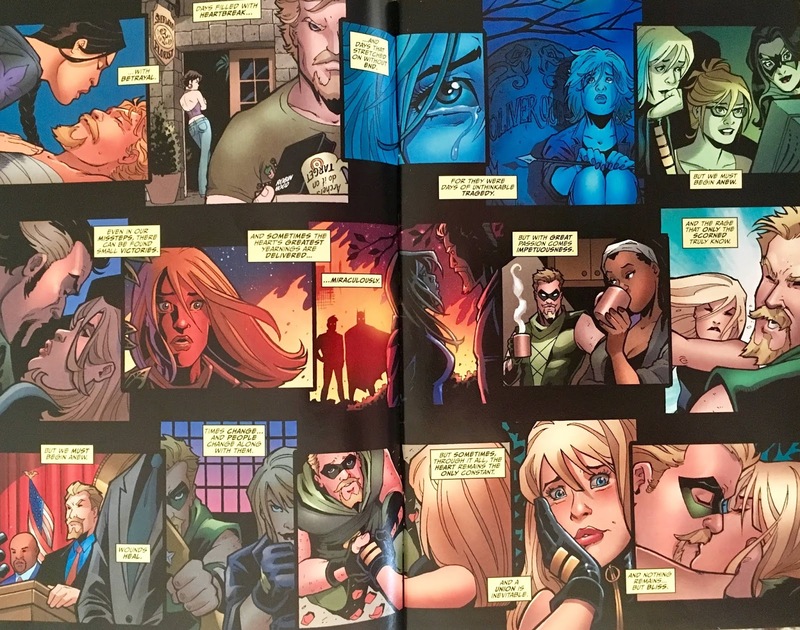 We open with a quick and dirty look at the Green Arrow/Black Canary relationship through the years. This gives Amanda Conner the opportunity to draw several key moments in Arrow/DC history... and man, it all looks awesome. We go from Hard-Travelin', to Ollie's death, to Birds of Prey, and then some... it's all very good. We then jump to the present, where Ollie and Dinah are arguing about a recent outing. Ollie's ticked that Dinah used her sonic scream before he fired an arrow, because it messed with his rhythm. This gets pretty heated, and naturally, lest we forget that Judd Winick's name is in the credits, leads to a hot 'n heavy makeout session... and very nearly to a full-on sesh. That's when Dinah drops the hammer. She suggests, since they're already engaged, that they wait to seal the deal for the skatey-eight hundredth time... until they're married. I think many of us have been here before. Ollie gives in, because... well, we all do... but asks for "one for the road". A few moments later, Ollie's taking a cold shower. Later, the happy couple start sending out their wedding invites... including one to our pal, Snapper Carr! Poor Snap's kind of a running gag during this issue... wonder if Winick read Hourman? 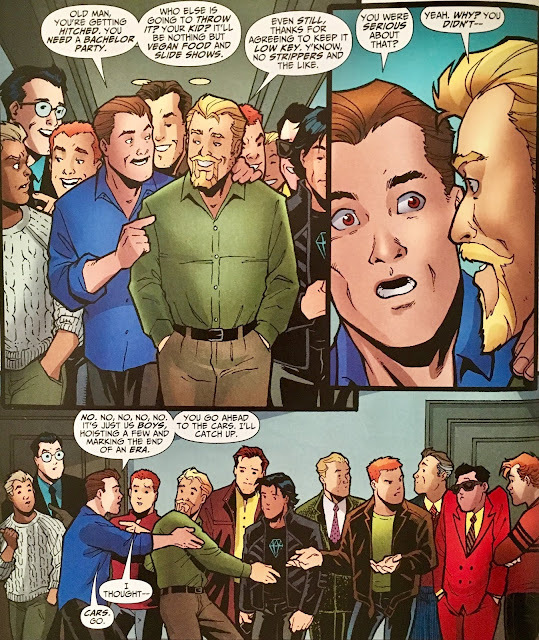 Anyhoo, Ollie's irked that all of their pals will be in "uniform"... which, ya know... is a silly complaint considering the gaggle of folks they're inviting. Speaking of those folks, we get a big ol' page of reaction shots here... annnnd, it's pretty great. Oh, and naturally, Batman declines. We shift over to a chat between Wonder Woman and Superman... who have also just received their invitations. They have an almost contentious discussion about marrying "in the biz". 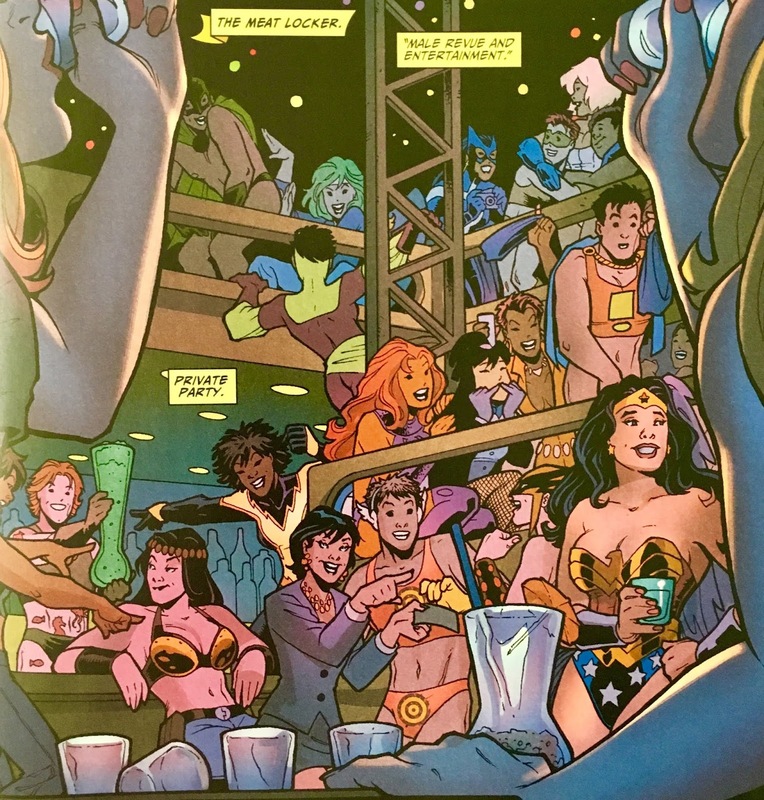 Diana suggests that they stick to co-mingling with civvies... kinda like Clark did with Lois. 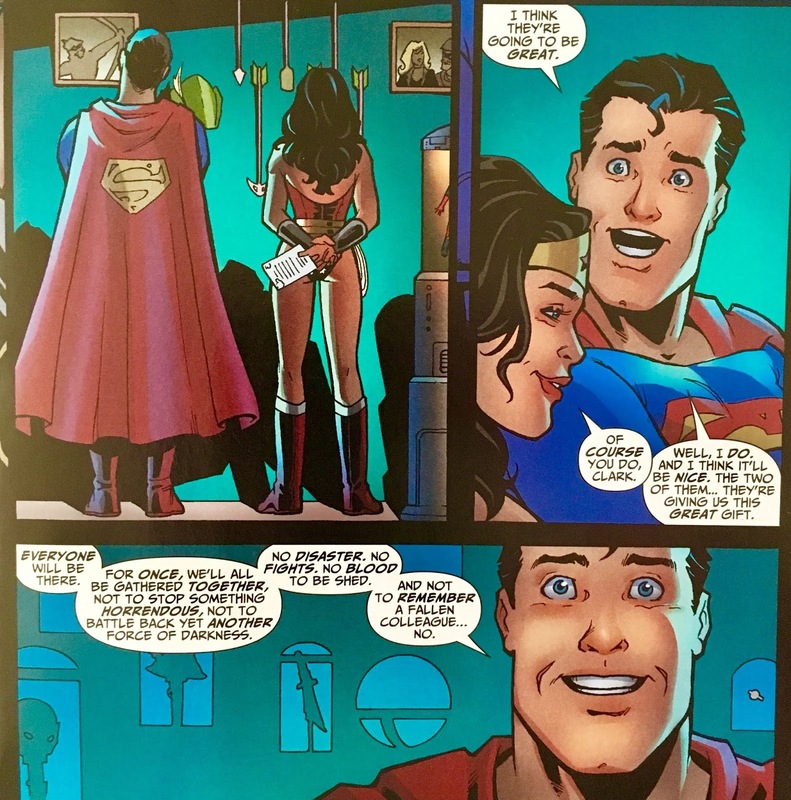 Superman, who I gotta say, is in full-on chucklehead mode here, thinks Ollie and Dinah are in it for the long-haul. 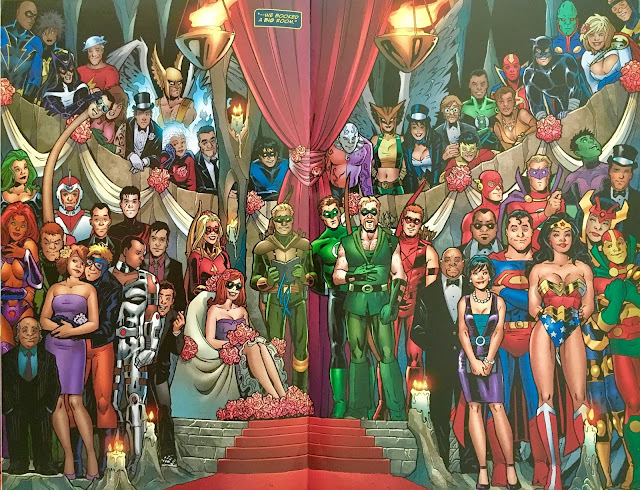 He's also happy that the hero community has an opportunity to come together for a wedding... instead of a funeral. 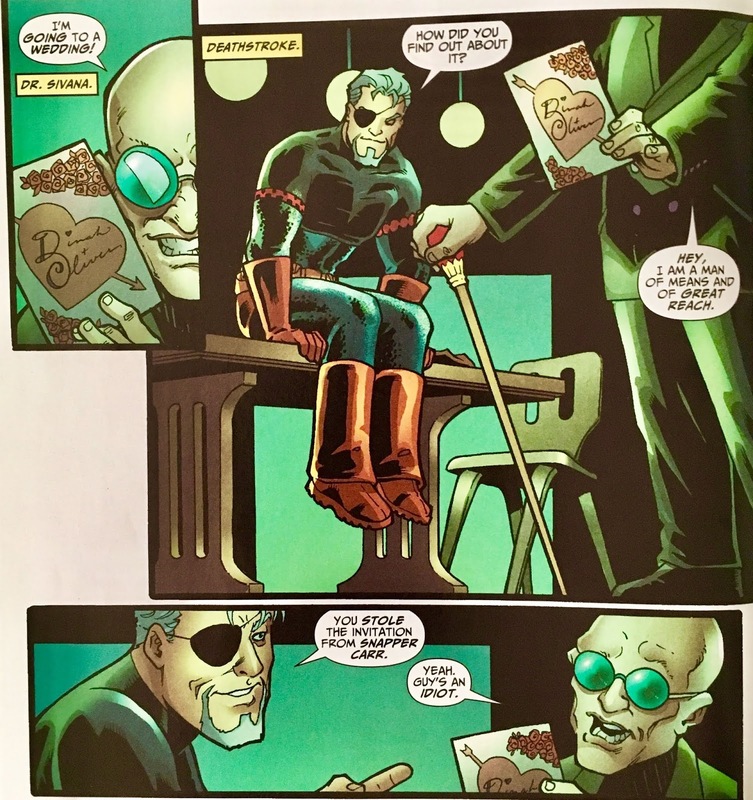 Elsewhere, Dr. Sivana chats up Deathstroke... who is sitting on a table in the most adorable way possible. It's like his daddy propped him up there or something. 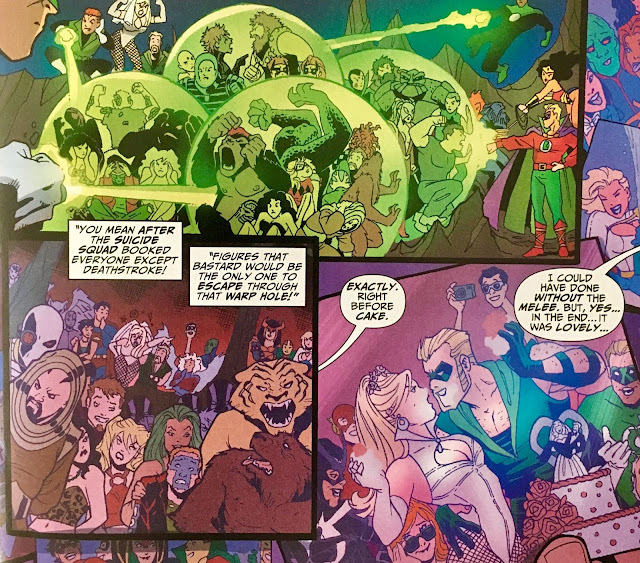 Anyhoo, Sivana stole Snapper Carr's invitation, and suggests all of the baddies get together and spoil the party. Slade gives a hearty thumbs-up. Next stop, Ollie's bachelor party. Well, kinda. Ya see, Hal's got a whole lotta strippers waiting for the gang in the next room over... but Ollie don't play that. And so, it looks like Hal just dropped a lotta cash for nothing. Worth noting, however, a lot of these strippers are dressed like female superheroes... so, yeah, this might... I dunno, form some strange associations moving forward. 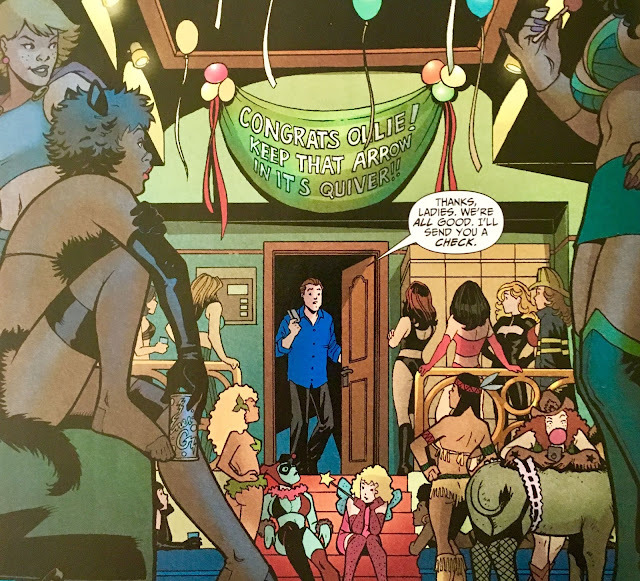 I mean, if Ollie were to, say, get a lap-dance from a stripper dressed like Power Girl... could he look at the real-deal the same way ever again? The women, on the other hand, are at "The Meat Locker" watching dudes... dressed like superheroes... strip. I guess they have no compunction about making odd mental associations. Dinah and Babs chat about the upcoming wedding as they stuff singles into dudes' thongs. Next... the wedding day! Everybody shows up... and it's a heckuvan image. Really a who's-who of mid-2000's DC Comics! Then... here comes the bride. 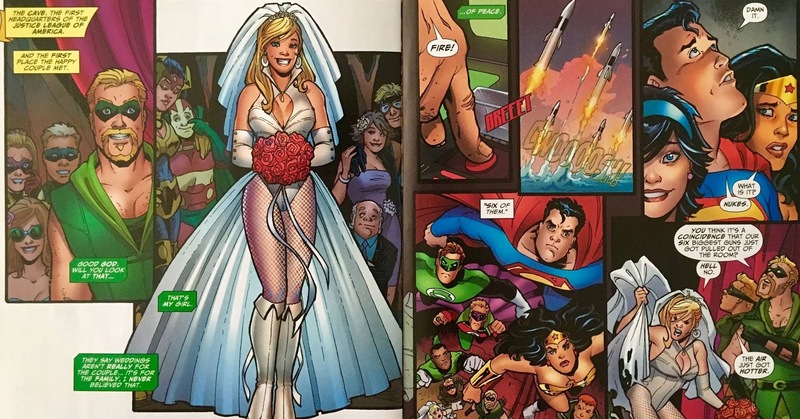 Before Dinah can make it to the alter, however, Superman senses six nukes being launched... which means, all of the heaviest hitters (Superman, Wonder Woman, and the Lanterns) are off to save the world. No sooner do the "big guns" leave, than... Deathstroke and the gang pop in! Needless to say, a fight follows. 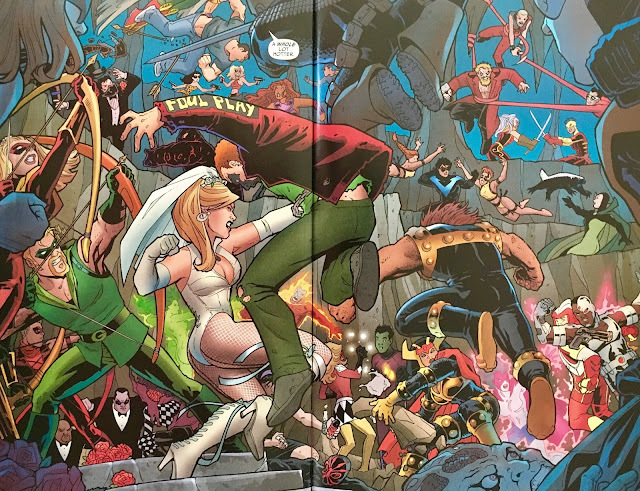 During the skirmish, Monsieur Mallah punches Ring-Bearer Roy Harper in the back... which sends Dinah's wedding ring bouncing into the fracas. She drops everything and bolts after it. Deathstroke manages to catch the ring on the tippity-top of his sword... which leads to him getting kicked in the... uh, midsection. fortunately for Slade, he's wearing a cup. Worth mentioning, this is a really amazing little action scene. Then... Batman shows up! Ya see, he declined the invite to the wedding... but he's always up for a fight. By now, the "big guns" have solved the nuke-problem, and have returned. 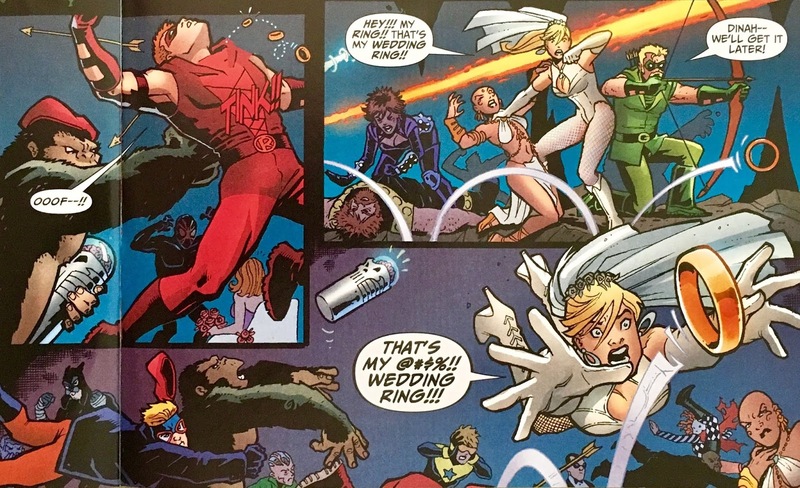 The baddies are wrangled up in no time... and the (rest of the) wedding goes off without a hitch. Well, they get hitched... but, you know what I mean. But then... Ollie gets a crazed look in his eye. 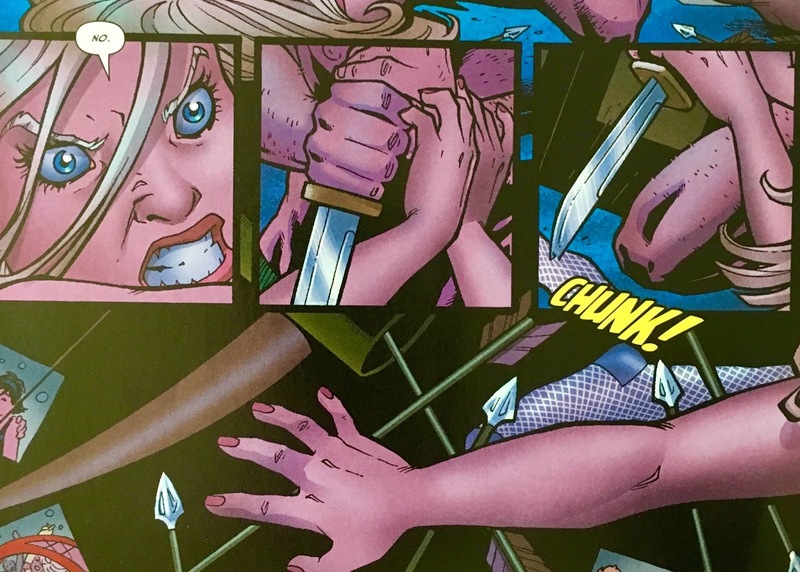 Brandishing a knife, he tackles Dinah to the floor! 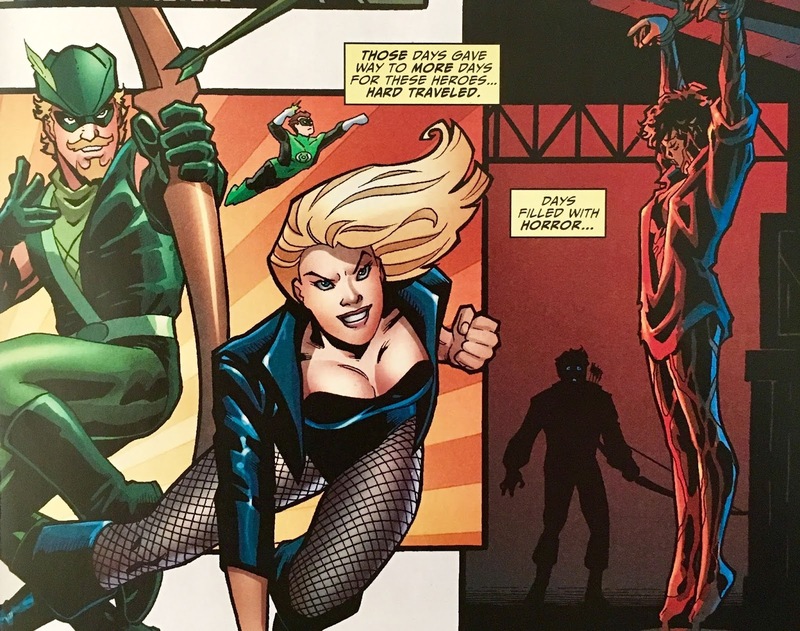 In the struggle, Dinah reaches for something, anything with which she can fight Ollie off... and finds, an arrow. 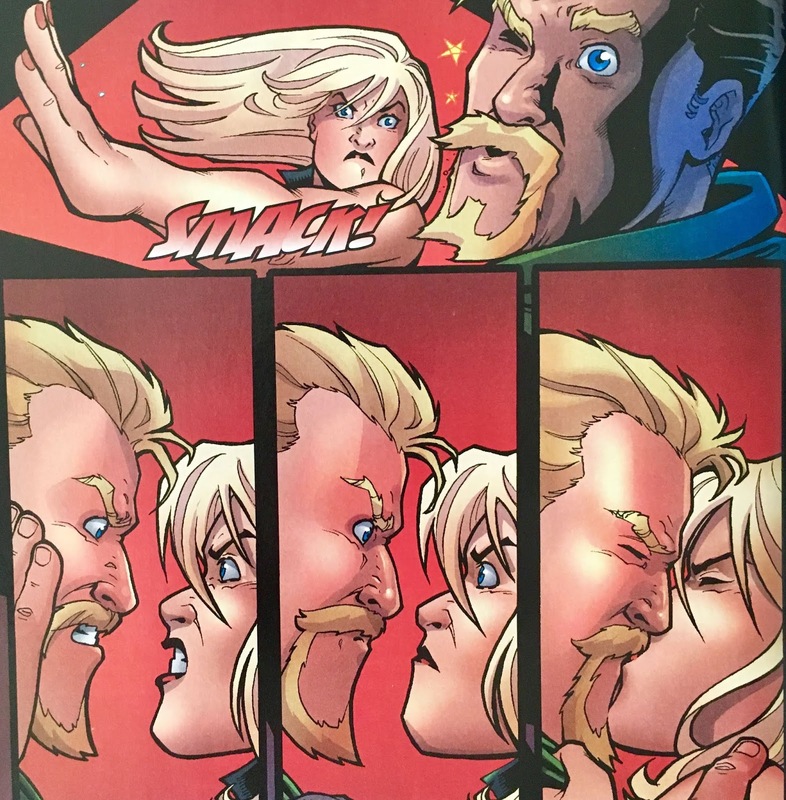 We close with her jamming it right through Ollie's throat! That there's what we call a cliffhanger! Okay, how much fun was this? And, holy cow... that art! 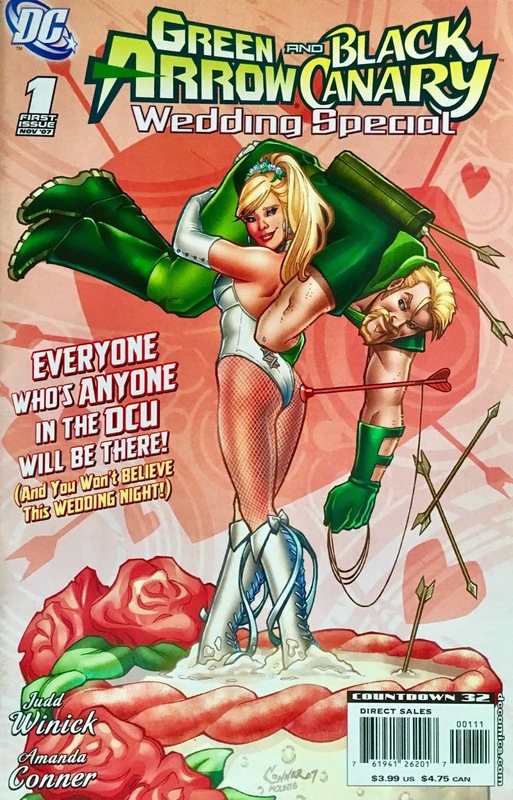 This issue both embraces and kinda subverts the classic "superhero wedding" tropes. Sure, the proceedings are interrupted... but, I can't think of another time where the bride just hops into the action, and goes toe to toe with someone as bad as Deathstroke. We saw something kinda similar during the JSA Thanksgiving issue, where some baddies showed up... and instantly realized that they were jolly well screwed. I'm still sitting here with a silly smile on my face just thinking about it. This was really so good. 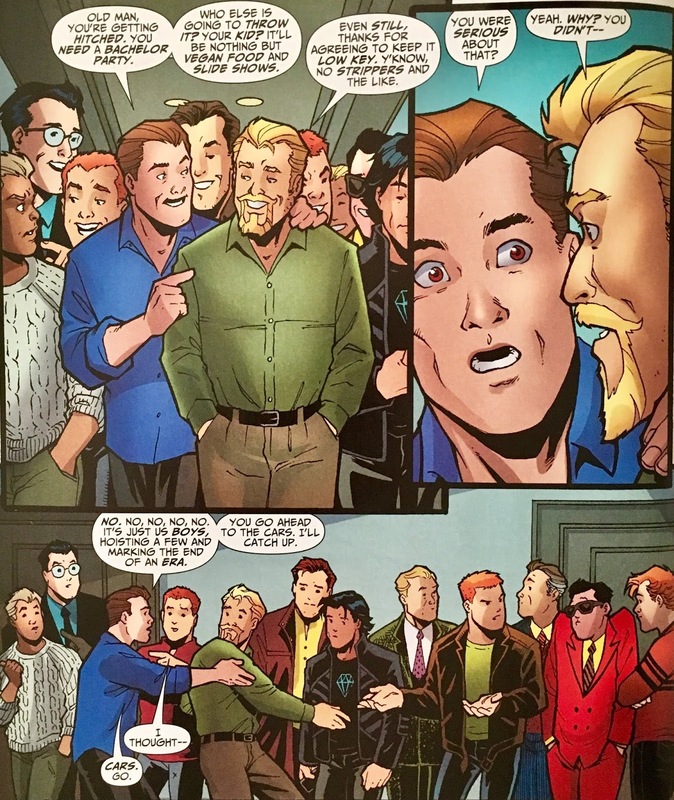 I gotta hand it to Winick here. When I think of his writing... especially in situations that involve a bedroom... "subtlety" is not a word I'd ever think of using. I mean, this is the fella who gave us a full-on bed scene between Monsieur Mallah and the Brain because of a gag Grant Morrison included in an old Doom Patrol issue. Think of it as "fan-service", think of it as "pushing the envelope", hell... think of it as "Winick's Razor", if the simplest solution involves a bed (or back seat of a car, or pile of trash in an alley, etc.) you know where the scene is likely to go. Here, however... we kinda sidestep that! Sure, we get "teased" (just like poor Ollie), but it's actually (sorta) in service of the story. That opening scene where Dinah suggests they "wait"... that's real-life right there! I can't get mad at that. Now, there's that art. I cannot believe I've been at this discussion/reviewing thing for two and a half years, and this is the first time we're talking about Amanda Conner! Seems wrong that it's taken us this long, considering how large she looms over so many of my favorite DC Comics, and how big a fan of her work I am! Her work here (as we've come to expect) is phenomenal. Just absolute candy for the eyes. Faces are full of emotion, body language is so fluid... just, really... there ain't no words. Just spectacular. It's art like this that makes this book look like it was a top priority for DC Comics... and it was most certainly the best way to usher in a brand-new ongoing series. 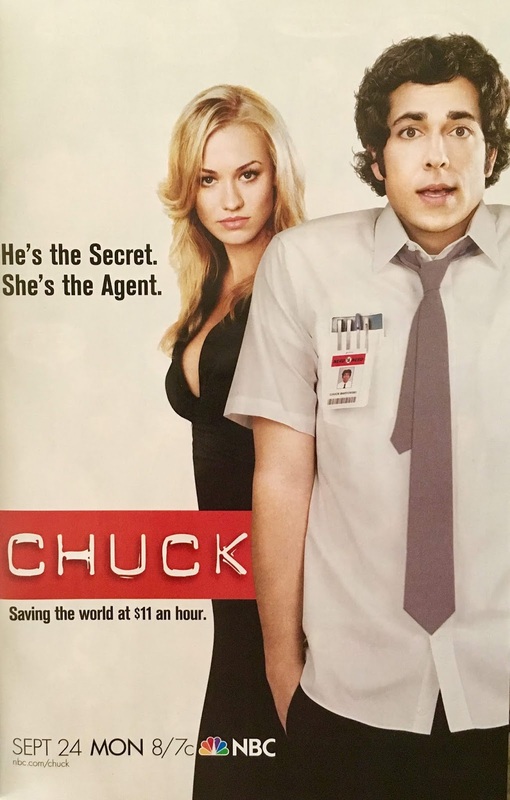 Speaking of "ushering in"... howsabout that cliffhanger? I loved it! I don't have the foggiest clue where it's headed... I was very low on funds when this series launched, so I didn't get to read it the first time around... but, gotta say... I'm intrigued enough to try and track it down! Hell, I might actually have it... somewhere, unread... and lonely. 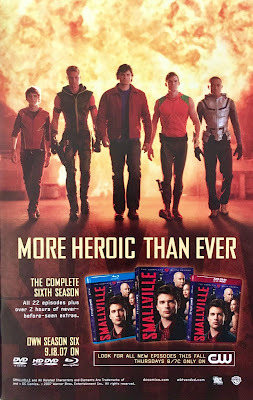 Overall... if you dig DC Comics at all, I think you'll dig this one. It's really too much fun not to recommend... and again, that art. For your nuptial convenience, this bugger's available digitally and has been collected in the Green Arrow: A Celebration of 75 Years hardcover.